It took some time to sort through all the papers, looking for dates, names and origins, but eventually I constructed a list of documents arranged by date. The indenture that was brought in to class was written in 1761 and is the oldest of the collection. But why is it in this archive? Not finding any immediate answers, I began looking at the other documents for the answer. 12.25 tinches wide, 7 inches high on the left side and 6 inches high on the right. Fine paper with a watermark in the “English Arms” style, showing a shield divided into quadrants, surrounded by a crowned framed. This watermark was similar to a paper made by Jessups of Westfield, Massachusetts in 1812. The writing is in a fine cursive hand with ink that is now a dark brown. It reads, “Daughter Abigail Langdon to her Hon’rd Mother Abigail Langdon By her share of the Real Personal Estate of her Late Hon’rd Father Nathaniel Langdon dec’d 178•15•5 1/4”, this total appears to come from a list on the left side of the document, which is a detailed list of silver and cash that was the content of this will. The total was 178•15•5 1/4 in value, I’m assuming this amount is in English pound sterling. Using the data provided by www.measuringworth. com, there is a calculation that takes 178 pounds sterling into 2011 USD dollars at about $350,000 dollars, a considerable sum. By searching for “Abigail Langdon” together with “Nathaniel Langdon” on the internet I discovered the first genealogical website that gave consistent dates for birth and deaths of the individual mentioned. Nathaniel LANGDON born 14 September 1695 Boston. 1. Nathaniel LANGDON born 2 March 1741 Boston. Died c. 1819. 2. Abigail LANGDON born 9 August 1743 Boston. 3. Elizabeth LANGDON born 17 December 1744 Boston. 4. Josiah LANGDON born 3 March 1746 Boston. Died 24 February 1779 Sudbury, Middlesex, Mass. 5. John LANGDON born 28 July 1747 Boston. Bookseller; captain in the revolutionary army; customs house officer; died August 1793 Boston. 6. Mary (Nabby) LANGDON born 11 July 1748 Boston. Died 30 January 1799. 7. Elizabeth LANGDON born 8 October 1749 Boston. Died c. 1779. 8. William LANGDON born 28 September 1750 Boston. Died May 1820. Chester, Pennsylvania. Buried 1821 Cecil, Maryland. 9. Samuel LANGDON born 6 October 1752 Boston. 10. Ephraim LANGDON born 29 October 1754 Boston. Died – shipwrecked. 11. Joanna LANGDON born 28 March 1755 Boston. 12. Priscilla LANGDON born 28 July 1756 Boston. Because this appears to be a legal document from Abigail, I began my search here. Within a short time I found a page in a record book stating that Abigail was the executor of the Nathaniel Langdon estate and had the right to complete a real estate deal begun while Nathaniel was still alive. Now I had several names to search, I had a locale, all I needed was verification. Another database had much the same information with the inclusion of information about Abigail Langdon’s husband. Abigail married Thomas Bumstead on the 17th day of November, 1767. Apparently four months afterward after she had inherited over a quarter of a million dollars, she suddenly wed at the age of 24. I‘m sure that she was a capable young woman; her father passed over his namesake, and eldest son, and instead made Abigail the executor of his estate. Twenty-four is not a spinster in our time but most young women were married with several children in the 19th century. The one thing that stood out to me was the name “Bumstead”, I had seen it several times in the archive. Carrying the research a little farther reveals Thomas & Abigail had 6 children. The fourth child, John Bumstead, marries Lanah Gore and they have two daughters, Frances Gore and Mary Pierce. Mary Pierce Bumstead marries John Milton Fessenden on May 24, 1834 according to several websites that researched the Fessenden surname. John and Mary Fessenden have four children, and the third child is Mary Bradford Fessenden. Mary Bradford Fessenden marries Charles Carroll Truesdell on Nov 17, 1869. 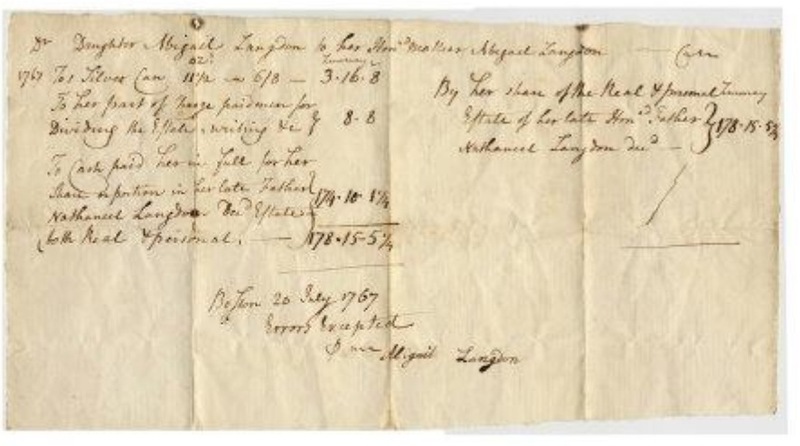 The Abigail Langdon document is a piece of family history handed down through four generations. There doesn’t appear to be anything else earlier, and there is only the one document, but somehow in each generation it was cared for, protected, and passed on to the next generation. Who were these people? He was born in September of 1695 and died December 1757 at 62 years of age. He had obviously done very well at managing money, either keeping what had been passed on to him, or he built a small fortune for his family. His father was John Langdon and his mother was Elizabeth. John was from Braunton, England and Elizabeth was from Boston, MA, so one could suppose that Nathaniel was born in Boston as well. Additionally, I found an interesting article about the Bumstead family home in Boston. “BUMSTEAD PLACE, so called from 1807 until 1868, was named after Thomas Bumstead, who became the owner of Adino Paddock’s estate. It extended from Common Street, midway between Hamilton Place and Bromfield’s Lane, easterly for a distance of about 250 feet, and then turned northerly for about 125 feet into the latter thoroughfare. Thomas Bumstead owned and occupied a wooden dwelling house on the south corner of Bromfield’s Lane and Common Street. He also owned the northerly part of the Cathedral land, and mention of him has been made elsewhere in this volume. ADINO PADDOCK (1728-1804), chaise-maker, owned a large portion of the land on the east side of Tremont Street, between the historic Winter Street corner lot and Rawson’s Lane (now Bromfield Street), which was named after Edward Rawson, who was Secretary of the Colony for many years. Mr. Paddock bought the northerly part, which abutted on the Lane, from Thomas Gushing, merchant, in May, 1760; and within a few years thereafter, he purchased other lots, including a part of the estate of Edward Bromfield, which had been conveyed to the latter by Abigail Gillam in March, 1739. His home-lot was bought of William Lewis, merchant, in 1772. Here were a large dwelling house, garden, yard, out-houses, a work-shop, barn, chaise-house, blacksmith’s shop and sheds. Captain Adino Paddock (a lineal descendant of Zachariah Paddock, who came over in the Mayflower while yet a minor) was the pioneer coachbuilder in Boston. He also built “chairs,” as the light one-horse chaises were called in those days. He served the town as a sealer of leather, and as a fireward. Captain Paddock was a prominent military man. He joined the Ancient and Honorable Artillery Company in 1762, and became Commander of the Boston Train of Artillery in 1768. He it was who gave to this part of Tremont Street the name of Long Acre, which, although never accepted officially, was long in popular use. The London Long Acre, a continuation of Great Queen Street, in the neighborhood of Covent Garden Theatre, is still a coach-building center. No doubt that Thomas’ ability to purchase the Paddock Estate was enhanced by his wife Abigail’s inheritance of 178.10 pounds sterling. The Bumstead family was very industrious with several businesses in wall paper, bookselling, publishing and shipping. John Bumstead was a major coal merchant.